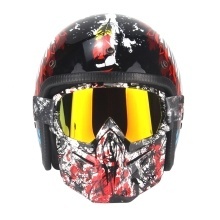 This helmet is made of high-quality ABS material, it is light weight and comfortable. You won&apos;t feel tired after wearing for a long time. Light weight, comfortable and portable. The lining is comfortable and not easy to get tired. Do not easy to scratch. It has simple and comfortable design, non-harm to you.